Published: Nov. 4, 2018 at 02:48 p.m.
Tampa Bay Buccaneers quarterback Ryan Fitzpatrick finds tight end O.J. Howard for a 3-yard touchdown. Published: Nov. 4, 2018 at 02:01 p.m.
Tampa Bay Buccaneers quarterback Ryan Fitzpatrick finds tight end O.J. Howard wide open for a 4-yard touchdown. Published: Oct. 14, 2018 at 02:32 p.m.
Tampa Bay Buccaneers quarterback Jameis Winston records his second touchdown of the day with a quick pass to tight end O.J. Howard. Published: Sept. 16, 2018 at 07:07 p.m. 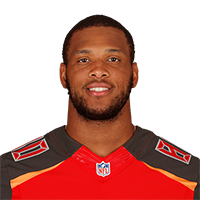 Check out Tampa Bay Buccaneers tight end O.J. Howard outrun the entire Eagles defense for a 75-yard catch and run touchdown.